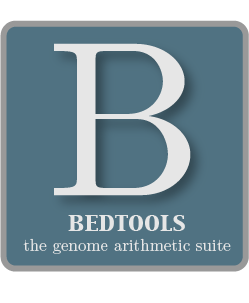 annotateBed annotates one BED/VCF/GFF file with the coverage and number of overlaps observed from multiple other BED/VCF/GFF files. In this way, it allows one to ask to what degree one feature coincides with multiple other feature types with a single command. -namesr A list of names (one per file) to describe each file in -i. These names will be printed as a header line. -counts Report the count of features in each file that overlap -i. Default behavior is to report the fraction of -i covered by each file. -both Report the count of features followed by the % coverage for each annotation file. Default is to report solely the fraction of -i covered by each file. -s Force strandedness. That is, only include hits in A that overlap B on the same strand. By default, hits are included without respect to strand. By default, the fraction of each feature covered by each annotation file is reported after the complete feature in the file to be annotated. 5.24.2 Default behavior - annotate one file with coverage from others. 5.24.5 Restrict the reporting to overlaps on the same strand.